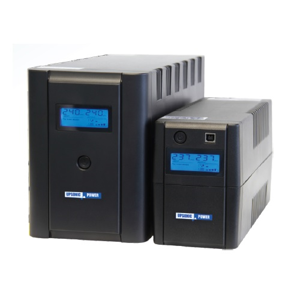 The DSV Series UPS is a high quality, versatile and affordable protection system for workstations, small business, POS equipment, Rollers Shutters, Pc's etc. This UPS features a state of the art automatic voltage regulator (AVR - Buck and Boost), which enables the UPS to maintain a secure and regulated output voltage, without utilising batteries, for mains voltages between 162VAC and 290VAC. The DSV Series has a voltage surge/spike suppressor and noise filter, providing continuous power protection under all operating conditions. In the event of a total power failure the DSV Series will provide <6 mSec change over to battery back-up from the maintenance free internal batteries. When the DSV Series is utilised with intelligent shutdown software, it is able to provide detailed information on the status of input power quality, record power events and perform a fully automatic system save and close-down in the event of a power failure. A RJ11/RJ45 (1 and 2 KVA) network connection ACA approved telephone line filter is integral with the Domestic Series UPS to protect sensitive Phone, fax and modem equipment, from power disturbances entering via the phone lines.